For seniors who still want the mobility to get around, their electric scooter allows them to move about comfortably and confidently, maintaining a sense of independence. But there are times when the scooter needs a lift to travel even further, perhaps on vacation or visiting family in another city. Just because they’re in a different location, a senior should not be deprived of their mobility. Thankfully, scooter car lifts provide the service of efficiently transporting mobility devices, so your senior is not limited. Scooter lifts are also great additions for caregivers; being able to take the elderly person you look after is accessible for day trips, shopping, appointments, and more. We’ve reviewed the best options and gathered them here so you can find the best fit for your situation. Why Get a Vehicle Lift? A scooter lift that requires no strength, simple to use, and will last for years. Excellent for travel scooters and wheelchairs. The Mini Lift Model 117 is an excellent option for seniors, caregivers, or family members as it is easy to use, easy to lift, and easily folds up. The Mini Lift Model can lift three- and four-wheel travel scooters as well as small travel power wheelchairs. The platform is large enough and made of all steel, thus strong enough to hold a scooter in place and easy to secure with the supplied tie-downs. The ease of this lift means anyone can work it, giving you the independence to travel where you need. And the lift works in hot weather, cold weather, and any other conditions–like rain or snow–without delay. A straightforward switch box on the top of the device is used to control the scooter lift, but a hand crank is also included in the case of power loss. When you or the senior in your life needs their mobility device, wherever they go, we recommend the Mini Lift Model for simplicity and ease of use. This boom lift has a high lifting capacity of 400 pounds and is compact and adjustable. The AL425 Axis II scooter lift is on our list because it works well with SUVs due to its compact design and high lifting capacity. If you or the senior in your life has a travel scooter, full-sized scooter, or a full-size power wheelchair, then this is the lift to use. As mentioned, it’s an ideal inside lift for SUVs, but also works well for vans and trucks. The scooter or chair is attached to the lift from either the back or the side of the vehicle. From there, maneuvering is simple and automatic. You can use the optional remote control for even more ease. The outstanding selling feature is that is only requires 30 inches of headroom for access. For seniors who rely on their mobility scooters, it’s a tremendous relief to know they can get away from home and still get around on their own. A lift that requires no strength and has additional security features like cambuckle straps and a key is needed for use. Hitches well to trucks with Class II or Class III hitch. The Harmar AL350 scooter lift works for both scooters and power wheelchairs and easily attaches to a hitch on the outside of your truck. Solidly built with a very large deck, the platform holds the rear wheels in place for added security, in addition to the four supplied tie-downs. The ease of use is so simple that once the scooter is driven into place, the lift pretty much does the rest of the work. The power switch is located on the head of the unit to control height as well as folding the deck in towards the vehicle when not in use. A key is required to turn on the power, adding extra security so only you control the lift. The Harmar’s simplicity means that most anyone with limited mobility issues can utilize it. Plus the design of the straps makes it easy to use for those with dexterity or strength challenges. For seniors this offers reassurance that their mobility is in their control. An affordable lift option with a sturdy ramp to transport smaller sized scooters. For seniors with smaller scooters, we recommend the Titan Medical Rack Ramp MC500 SC500, not only for its size, but for its affordability, making it a great option for seniors on a limited income. It is simple to remove and reattach for convenience, and the lift folds up against the vehicle when not in use. This scooter lift is not an electric device that goes up and down. Instead, a ramp folds down on the right side into an easy slope so you can drive your scooter directly up to the platform. There are three positions: locked and folded against the car, locked upright with an 80-90 degree angle when loaded, and down as a ramp. The lift is made of steel and will last for years. Holes along the platform make it easy to secure your scooter with cords of your choice. 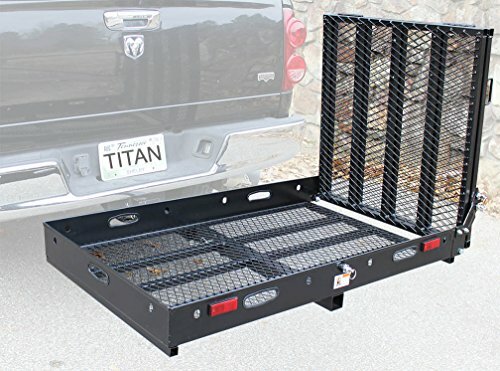 The reviews for the Titan Medical Rack Ramp not only praised its cost-effectiveness, but its solid construction as a must have for any smaller scooter or wheelchair. This scooter lift works on any vehicle to transport smaller sized scooters and power chairs with the ease of a ramp. An excellent scooter lift option, we recommend the FAR-250 Carrier for smaller sized scooters, travel scooters, and full-size power wheelchairs. While made of a durable steel, it is lightweight enough that many seniors are able to handle it on their own, ensuring their mobility and independence. The FAR-250 Carrier is a manual, outside lift that is straightforward to install providing a simple ramp for easy transportation. The lift comes with multiple tie-down holes to secure the scooter and adjustment bolts to prevent rattling. When not in use, the lift can fold against the back of the car for ease of parking. Great scooter lift that is not a permanent installation and eases to be transferred and installed in another car. The BackPacker Plus scooter lift is an inside electric lift that is mounted in the back of a minivan when removing the back seat. The existing floor latches that hold the rear seat connect with the carrier so no drilling or modifications need to be made. This lift is not a permanent installation, though it is possible to have it permanently added to your vehicle. The unit can easily be transferred and installed in another car. Use the battery pack as an outside source of power, so there is no need to connect to your car battery. The platform is controlled automatically and moves out, lowers to the ground, is loaded with your scooter and climbs back up and in the car. Alternative comparing to rear loading and safer for some people because you are next to the vehicle rather than behind where traffic is traveling. The AL690 Side-Door Hybrid Platform Lift stands out to us a wonderful alternative to rear loading lifts. We want our seniors to maintain their mobility and their independence, but we want them to remain safe. This lift does both as it is a side door loading lift; safer because you are next to the vehicle rather than behind where traffic is traveling. This carrier is designed to fit into the second row of seating for vans. The platform comes outside the car, the scooter loads, and the platform moves into the vehicle through the side door. No drilling or special mounting parts needed. We recommend the Side-Door Hybrid Platform Lift for senior travel scooters and full-size power wheelchairs. It functions with a standard remote hand control and requires no strength to maneuver. For seniors, having their chair transported inside a vehicle will also help prevent wear and tear. Getting out and about is an integral part of living, keeping a daily routine, and maintaining a sense of independence—especially for seniors aging in place. With a proper vehicle lift, they can make going out an everyday event. If you are a caretaker or have a loved one who requires a scooter, a vehicle lift introduces new adventures. On their own, or together with you, going to the movies, going out to eat, and going shopping all become possible. Vehicle lifts are also crucial if the senior you care for requires multiple doctor visits. Going to the doctor isn’t always enjoyable, but it is essential. And by bringing their mobility device, you have increased your loved one’s confidence and independence. And scooter lifts don’t need to be a burden. Many seniors prefer to lease vehicles, and the good news is that many scooter lifts work well in leased vehicles. Outside lifts can be attached to any car with the proper hitch, and many inside lifts are now designed to have no permanent installation and require no modification. Inside lifts are typically designed for vans and SUVs. They can be side-door access or rear access. The scooter or power chair travels directly inside the vehicle. An inside lift is an excellent option if you want to protect your power chair from wear and tear while traveling. Some people prefer side-door lifts, which are limited to inside lifts because they can be safer to use. When loading a rear lift, you are vulnerable to traffic traveling past the vehicle. Side-door lifts keep you next to the car. Outside lifts attach to the rear of your vehicle, and you can find one compatible with nearly any car. Outside lifts do fold against the trunk or tailgate when not in use, but once a scooter is loaded it extends the length of the vehicle. Sometimes it becomes tricky to find a parking space to accommodate the extended range. When considering the right scooter car lift, consider the weight of your scooter and the type of lift you want. Inside and outside lifts have their benefits. Also, understand your own ability and strength and/or that of your senior, and consider if a manual lift with a ramp is possible or if you prefer the ease of an automatic, electric lift.